The ancient Aztec civilisation was a wealthy one, with many secrets and treasures. Travel deep into the Central American jungle with Azteca Gold, a slot game with a shimmering sheen and alluring rewards. You are guided on this adventure by a fellow explorer who takes you to Aztec ruins that give players the opportunity of big rewards. Hunt for golden statues and big payouts in this 5 reel, 3 row slot game. With good bonus features, atmospheric music and detailed design, you are well and truly transported. Place your deposit and start spinning to see if you’re a winner. Azteca Gold is a pretty typical Playtech offer, with detailed, consistent illustration and good features to keep gameplay interesting. There are 20 possible paylines, a bonus game and the chance for free spins. The theme is fun and immersive with a sense of discovery and great features. The lower value 10, J, K, Q and A symbols resemble carved and painted stone, with the higher value symbols looking like photographs from this adventure. There’s a lemur, a rucksack, a by-plane and gold statues. There’s an explorer symbol that gives you 12 free spins and a multiplier if she lands at least 3 times, and 3 or more statues on the same line trigger the bonus game. The gold statue symbol is particularly stunning and demonstrates great illustration skill. The bonus game has 2 stages. In the first stage, you are tasked with collecting the gold figures, which give you a range of different prizes. One of these prizes is the Temple of the Sun, which activates the second stage of the bonus game that comes with the chance of winning further multipliers. This is a particularly lucrative feature if you have the luck of these ancient people. 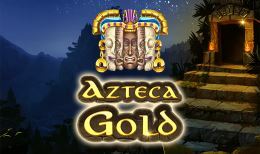 Azteca Gold is an exciting game with a great sense of adventure and excitement backed up by some great bonus features. This is an all-around good game that doesn’t get boring, but neither is it overly complex. It convincingly transports players to the jungle, and the multi-layered bonus game adds a particularly unique feature. Playtech is one of the most well-known and experienced developers in the slot game industry, so this is certain to be an appealing game to new and seasoned players alike. Head to the jungle and start spinning to see if you’re in the Aztecs’ favour.